David Austin Roses were delighted to announce that their rose garden exhibit at the Chelsea Flower Show has been awarded a gold medal. This accolade was combined with the premiere of three new varieties and a warm welcome to a Hollywood star, Dame Judi Dench. 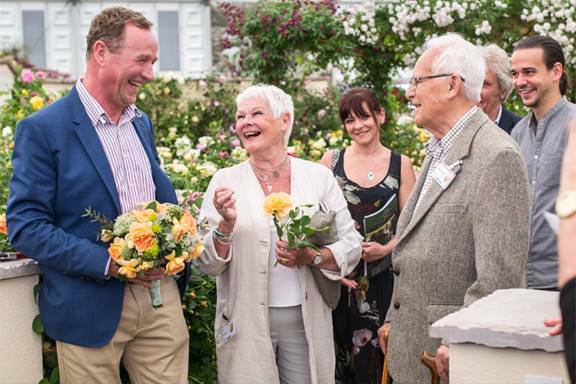 This week, three generations of the Austin family welcomed the great British icon of stage and screen, Dame Judi Dench, to the David Austin rose garden at the Chelsea Flower Show to officially launch the new English Rose named in her honour. Dame Judi was delighted with the accolade commenting "…. would a rose by any other name smell as sweet….isn't it beautiful. It is very healthy and has a rather laid-back quality". The relaxed style of the rose tickled Dame Judi's sense of humour - and she appeared rather chuffed with the rose's qualities - indeed the characteristics of the rose seemed to be the perfect match for its namesake. David Austin were also pleased to announce that their garden won Gold this week bringing their Chelsea Gold Medal total to 23.